Cool morning and pleasant afternoons are ahead. Skies will remain mostly clear. Today and Tonight: Tuesday should feel great with high temperatures in the low 70s beneath mostly sunny skies. Winds will be light and northeasterly. Another cool and clear night is on tap with low temperatures slated for the low 50s. Up Next: Wednesday will bring more weather that is seasonable before a slight warming trend begins on Thursday and Friday. Humidity may notch up a bit as well. These changes will come ahead of another cold front that will push through the area. The front appears to be a fast mover but may bring some showers on Saturday, before a more significant drop in temperatures. At this time, it looks as though lows will bottom out in the 40s Sunday and Monday mornings. The week of Thanksgiving looks to be cool. The Climate Prediction Center is expecting average or slightly below average temperatures for southeast Louisiana and southwest Mississippi for the middle and end of next week. 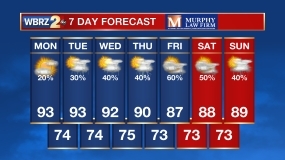 Average for that time of year would be a high of 70 and a low of 47. It may actually "feel" like Thanksgiving. That is a ways out though so we will see how the forecast changes. 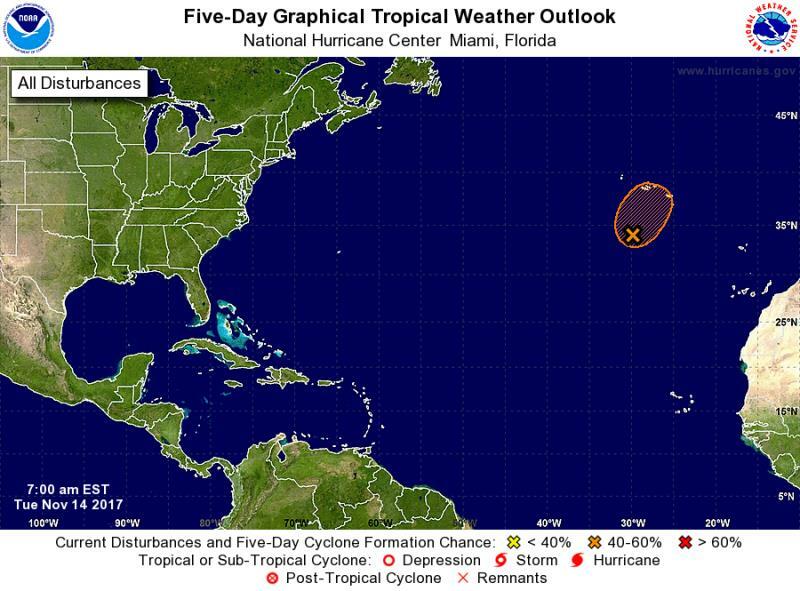 The Tropics: Way out in the Atlantic Ocean, a disturbance more than 500 miles south of the Azores has a 50 percent chance of development as it moves northeast over the next 5 days. If anything becomes of this system, it will likely be subtropical and will not impact the U.S. in any way. High pressure will build over the area bringing tranquil weather fore the next several days. Mainly clear skies are anticipated through midweek. Temperatures will be very close to seasonal average with highs in the low 70s and lows in the low 50s. Highs will be creeping back up later this week as an upper trough to the east moves out into the Atlantic Ocean. The next chance of rain and another cool down will be this weekend as a cold front moves toward the area. This cold front appears to be leading a charge on an extended stretch of below average temperatures. A deep trough will dig into the Eastern United States by Sunday and likely persist for several days. The trough looks quite anomalous for the time of year, meaning temperatures could end up well below average. With the trough positioned over the Southeast and a ridge in the west, this general pattern will hold through early next week. A shortwave diving down the eastern flank of the ridge could reinforce the trough later next week leading to a cool Thanksgiving. At this time, ensemble model output is suggest several days with highs in the low 60s and lows in the low 40s.